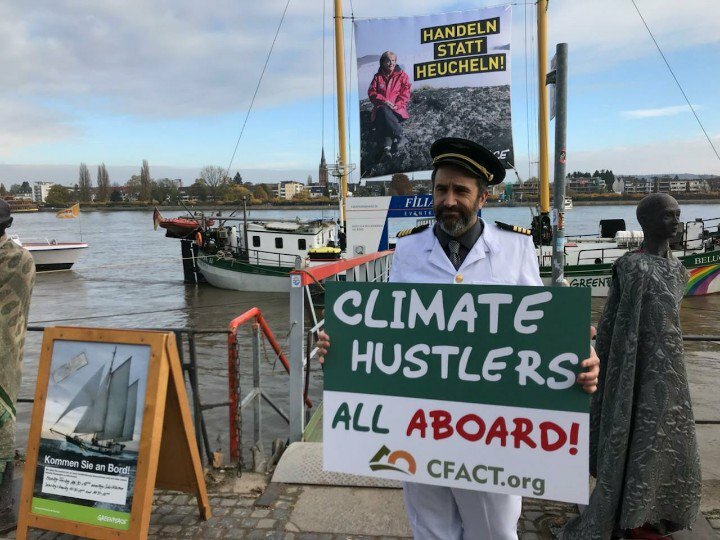 Climate Depot’s Marc Morano made his annual trek to the United Nations climate talks, where he and his colleagues like to tweak climate campaigners and delegates with their well-greased climate science-denying PR machine. Most years, CFACT (The Commitee for a Constructive Tomorrow), which publishes Morano’s Climate Depot website, will hold a press conference, but this year none is on the schedule. To fill his time this morning, Morano, who loves to play dress-up, donned a captain’s outfit and mocked a Greenpeace campaign boat. And here he is responding to a question about the 97 percent consensus, and somehow equating Harvard-educated scientists and politicians to the judges in the Salem witch trials. Next year, the climate talks will be held in Katowice, Poland, and we expect that Morano will be back singing the praises of fossil fuels (especially Polish coal), and dismissing the scientific realities of climate change.